Founded by artist manager and live entertainment producer Jared Paul, Happy Place originally opened in LA in 2017, and is now taking its heaping helping of happiness to Chicago (June 28-September 3). This massive pop-up experience is bursting with quirky, larger-than-life-size installations, multi-sensory themed rooms, and dozens of immersive experiences, specifically curated to “Capture Your Happy” and create selfie nirvana (#WeAreHappyPlace) — the Upside Room is an IG must, by the way. 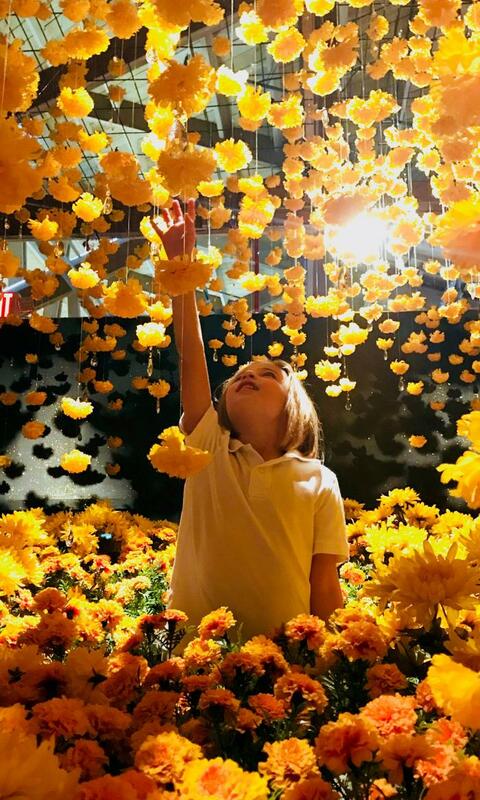 Imagine dancing in the middle of the world’s largest indoor Confetti Dome, jumping off a double rainbow into a pot of happiness, posing inside a rubber ducky bathtub, and taking photos in the flower-filled Super Bloom Room. Makes you feel pretty good, right? You’ll also come face to face with 7-foot stilettos made of a million candies and a 6-foot-tall X and O composed of thousands of tiny mirrors, surrounded by a wall of one-thousand red lips. All this bliss takes place in a 20,000-square-foot-plus indoor/outdoor space located at 1004 N Elston Avenue. Not only does Happy Place offer unlimited photo opportunities, but you can indulge in samples and treats along the way, and revel in the Happy Place backyard, which includes a lemonade stand (set to donate net proceeds to a local Chicago charity), classic lawn games and a specially curated retail store. There’s also a specially crafted menu, featuring happy-themed foods (of course), including Instagrammable foodie things. The exhibition’s LA run was sold out, drawing more than 100,000 people. So get your tickets fast! Admission is by timed entry, with ticket prices set at $30/$35 (depending on the day), plus a $2.50 service fee. 1004 N Elston Avenue is only a 10-minute walk from the Chicago Blue Line CTA stop. Valet parking is also available. Hours are Monday, Wednesday and Thursday: 11:00 a.m. – 8:00 p.m., Friday, Saturday and Sunday: 10:00 a.m. – 8:00 p.m. The exhibit is closed on Tuesdays except for July 3 (11:00 a.m. – 8:00 p.m.), and will be closed on Wednesday, July 4 in observance of Independence Day.